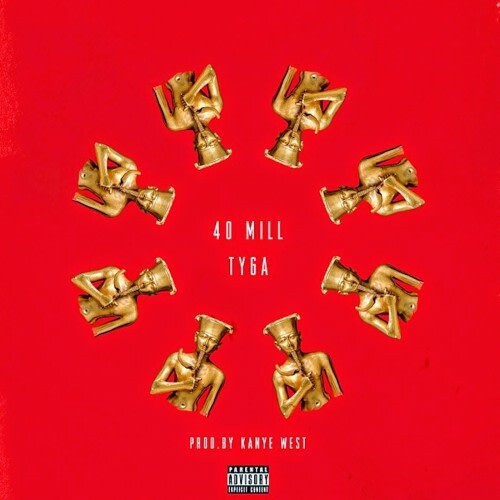 Despite calling out his label last week and threatening to leak his own album, Tyga returns to release his new single, "40 Mill," today, which is produced by Kanye West. It is worth noting though, that under label on the iTunes link, it says "Last Kings Music" and not "Cash Money Records Inc." like his previous singles and albums. During his Twitter rant last week, Tyga not only threatened to leak the album, but also replied to a fan that he wasn&apos;t going to be on Young Money/Cash Money for very much longer, and based on this drop today, it appears that that move may have already been made. As for the record, the song is laced with some very dynamic production from &apos;Ye that features a menacing sequence of drums and hi-hats while Tyga raps about not wanting to be famous, but rather rich. Tyga&apos;s upcoming project, The Gold Album: 18th Dynasty, is slated to drop in November, but it&apos;s unclear if that will stick with his current label situation. Listen to the single below, and purchase the single on iTunes now.